Natreceutique is founded on the idea that the medical world and the natural world do not have to conflict but can find shared ground to make skin beautiful. If a dermatologist were to create a luxury natural line, this is what it would look like. 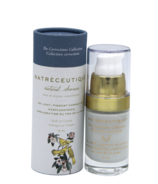 Natreceutique products include no fragrances (natural or not). No essential oils. No allergens. They provide products to help correct the most common issues they treat. However, also help prevent concerns and nourish the skin as part of a holistic approach.They have a focus on efficacy and choose natural actives which they use in high and effective concentrations while paying attention to their processing. Natreceutique also avoids harsh solvents and byproducts to preserve the integrity of natural actives. This is Nature distilled in its most pristine form.